With Christmas fast approaching many of you will no doubt be getting underway with your Christmas shopping. I've lost count of the number of men I've seen out shopping near Christmas looking panicked trying to find gifts for their other half. Ask Her Friends aims to resolve this by taking the stress out of shopping for men and leaving them confident you'll love the gift they've chosen. If you're not overjoyed at the prospect of receiving yet another set of mismatched underwear or a kitchen appliance introduce your man to the site where he can log on and answer a range of questions on your style and personality to help find that perfect present. Ask Her Friends are partnered with a range of popular stores and designer boutiques offering a vast catalogue of products. He can browse the What's Hot section or search in a range of categories including fashion and beauty to help create a gift ideas list which he can then share with your friends via Facebook or Email to ask their advice on the perfect gift. You can even recommend which friends he should ask so you can make sure your best friends are on hand to advise! With gifts ranging from pamper days and weekend breaks to the latest must have beauty products they're sure to find something you'll love. 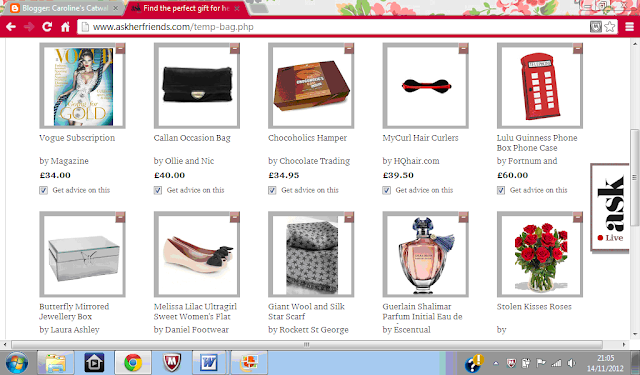 If they're stuck for inspiration they can turn to The Experts Blog for lots of great gift ideas. I had a go on the site at answering the questions and was very pleased to see the results recommending a Vogue Subscription, a phone case by Lulu Guinness and some super cute Melissa pumps. I'd be very happy to receive any of these .. prospective suitors take note! .. So ladies remember to direct your man to Ask Her Friends for a stress free Christmas all round.. you're sure to not be disappointed come Christmas morning! If only I had a other half!! This site looks fab... But when I do find a fella, I'll train him into get me something I like!!!! I've just had a little play with the website, it's so cool! Luckily my boyfriend is really good at buying for me.